Viva Energy looks done at $2.50. How much higher? It’s bookbuild day for the market’s newest top-100 contender Viva Energy, and the question is whether its brokers can get fund managers to cough up more than $2.50 a share. Merrill Lynch, Deutsche Bank and UBS’s equities desks will hit the phones on Tuesday morning, making one final pitch to get fundies to buy into the year’s biggest initial public offering. Fundies know the offer is just about covered at the bottom of the $2.50 to $2.65 a share range. If the brokers are to be believed – which old heads know is a big “if” heading into any bookbuild although ASIC’s new focus on equity capital markets deals is changing behaviours – Viva already has about $1.9 billion of the $2.4 billion it needs to hit the ASX-boards thanks to the broker firm offer and cornerstone process. Add in early bids, and it is likely to be covered at the bottom of the price range soon after the books open. Then it will be all about how much Vitol and its fellow pre-IPO investors can sell into the offer, and at what price. Early expectations are for a deal in the bottom half of what is a reasonably tight price range, with Vitol and co retaining close to a 50 per cent stake. Brokers scoured the big money funds as part of the cornerstone auction, locking in support at $2.50 a share or 6.5-times forecast EBITDA. They would know that by now plenty of the big cheque writers have headed offshore for mid-year breaks, and may not be too interested at stretching their bids too far above that multiple. Viva Energy’s closet comp – Caltex Australia – is trading at 7.48-times forecast earnings, according to Bloomberg data. ​Fundies and analysts have spent plenty of time comparing the pair during the past month, in an effort to price the newcomer and work out what it means for the incumbent. Macquarie analysts made a timely contribution to the debate on Monday, saying it was reasonable Caltex Australia was trading at about 8-times forward EBITDA. 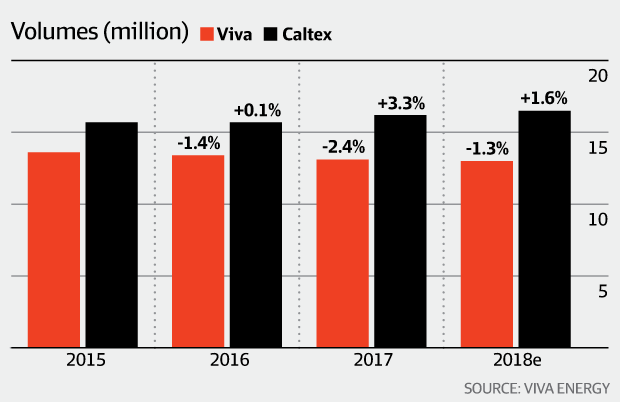 The analysts said Caltex Australia was less exposed to fuel refining than Viva Energy, while its fuel volumes were growing slightly and Viva Energy’s were falling. 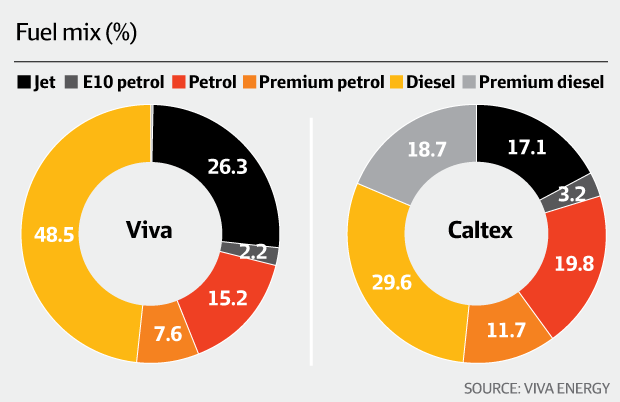 And Caltex made more of its earnings from premium fuels than the ASX-newcomer. Viva Energy’s bookbuild is scheduled to close on Wednesday. If successful, it would list with a $4.86 billion to $5.15 billion market capitalisation on Friday.